The Friends of Hebden Bridge Station was formed in September 2007 to help keep the station environs tidy, maintain the gardens to the station entrance and approach, and provide a library in one waiting room for rail users. We also seek to encourage greater use of public transport by lobbying for improved bus/train connections at the station and for disabled access to both platforms. Additionally we also seek to raise awareness with both residents and visitors that the station is an important part of the town's Victorian heritage, and to this end a permanent photographic exhibition on the history of the railway in the Upper Calder Valley has been mounted in the station's two heated waiting rooms. The Friends are always in need of more volunteers to help maintain the station gardens and keep the area neat and tidy. You don't have to be a rail buff to help - just turn up at one of our events! Engineered by George Stephenson, the Manchester and Leeds Railway along the Calder Valley was the first trans-Pennine railway. 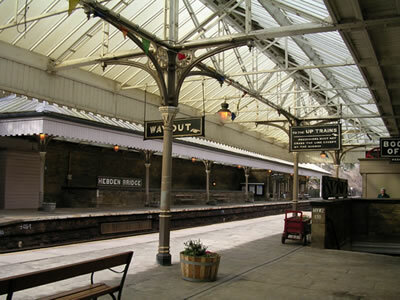 The line opened through Hebden Bridge in October 1840 when the first station was built here. The present Grade II Listed station dates from 1892-3 and was built by the Lancashire & Yorkshire Railway who owned the line until 1922. Unusually for a working main line station, it has been preserved and restored to its 19th century style and colours.